Cocora Valley. One of the most beautiful places in Colombia. A blanket of fog covered the green hills. 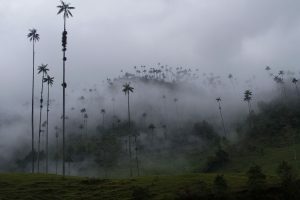 The majestic wax palms were disappearing and appearing all over again as the fog was moving. Finally, it was gone and veiled the beauty of the Cocora Valley. Few rays of light were lighting up small valleys and hills. The Valley is situated in the Coffee Region in Colombia at a high altitude between 1800 – 2400 meters above sea level. Its symbol is wax palm – Colombia’s national tree and the tallest palm in the world. Cocora Valley is their natural habitat and the only place where they grow. They can be up to 50 meters tall. You can visit the valley hiking or on a horse. The gateway to visit Cocora Valley is the colourful town of Salento. It lays at the altitude of 1895 meters above sea level and is situated in the Quindio department. You need just a couple of hours to visit Salento. The main places to visit are Plaza Bolivar, the picturesque Calle Mayor (street Mayor). And of course the viewpoints. To get there, you can climb 253 stairs at the end of Calle Mayor or drive there. Once you are up there, you can enjoy the views of the city or the valley. You can also have an arepa from a local seller. There are many hotels and hostels in Salento. If you plan a hike in the Cocora Valley, it is the best place to stay overnight. 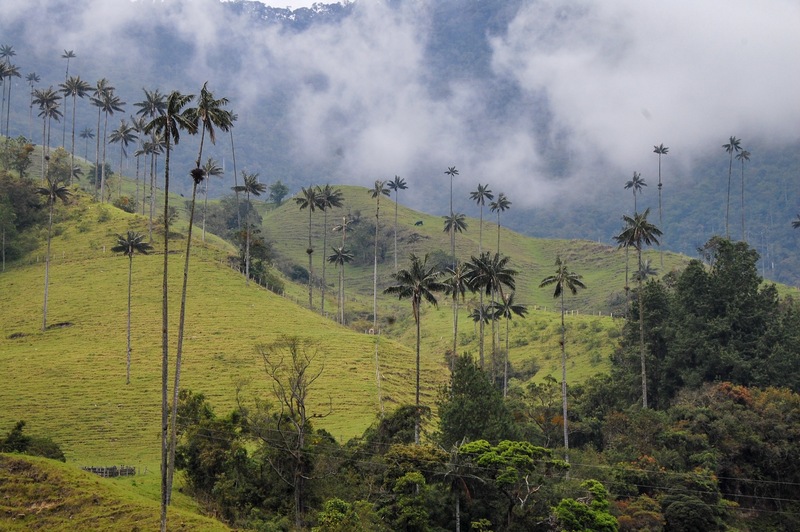 The Cocora Valley is 12 km away from Salento (20 minutes by car). The road after leaving Salento is quite curvy. It may rain almost every day in Cocora Valley. We had lovely weather in the morning. Then in the afternoon, it rained heavily. Due to its altitude, the valley has a temperate climate. The Andean Mountains stop the winds from the Pacific Ocean. It creates a humid environment that causes the growth of cloud forest. It is very common to see the valley covered with a mist of clouds, making it look very mysterious. From the Armenia Airport, it is about an hour on the Armenia / Pereira highway. It is almost the same distance from the Pereira airport. You can also drive from Bogota, and it can be up to 7-8 hours although it is about 300 km away. If you fly, consider renting a car to be able to drive around as all the attractions are in different places. Wow! This is the first time that I heard about Cocora Valley. It’s very picturesque. I would surely add it to my bucketlist. More power to your blog. Your photography is amazing! Cocora Valley looks really beautiful, I would like to visit this place in the future. Wow the place looks so natural. loves your pics would surely like to visit someday. Your description made me want to visit the place. Looks so calm. Awesome photos. i’ve always wanted to go to latin america & these pics you’ve captured only make me want to go more! Wow! This place looks so magical! The clouds are something out of this world. Thanks for all the tips about the area. It is good to know it rains constantly. Also, I really enjoyed the narrative style! It’s very literary and cool to read! Wow, this place looks absolutely amazing! I’d love to visit it some day. Lovely photos! Your pictures look so great! I am sure Cocora valley is a beautiful place to visit! Very picturesque nature views, wow! Would love to visit and try horse riding there! Thanks for the virtual tour! This place looks so beautiful! Looks like such a fun trip and your pictures are so pretty. This place looks really amazing. Never heard of it before. Thanks for sharing this ..would love to visit.